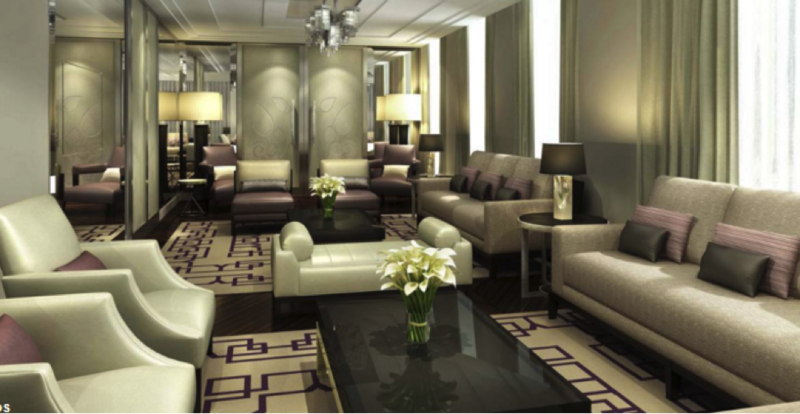 In interior design, it’s not only homes that designers focus on. In fact, there are more restaurants and hotels than ever before that are seeking out the most popular and renowned interior designers to make the interior really come to life. Hotels provide the perfect opportunity for people to get away and relax, returning home amazingly refreshed and rejuvenated. So, whether you’re thinking about getting away at some point this summer, or if you’re just after a little interior design inspiration, here are 6 of the newest hotels that are every interior designer’s dream. ME Miami is the first hotel opened in the States by this renowned Spanish hotel company, and the interior design in the rooms and reception is absolutely impeccable. Many hotel rooms tend to be rather stiff and uncharacteristic, lacking in personality and style. However, this is definitely not the case here. Each room at the ME Miami is filled with stunning neutral shades, dim lighting that enhances relaxation, and all the home comforts you could ask for, from comfy throws on the bed to books dotted around here and there. What more could you ask for? The Katamama Hotel in Bali, Indonesia, is a newly opened boutique hotel that’s full of character and style. This modern, edgy and contemporary hotel provides a number of different suites, and the one in the picture is the Pool View one. The way the bed doubles up as a minimalistic desk is fantastic, and the quirky pendant light draws the perfect amount of attention to the retro-inspired coffee table and the area rug underneath. Plus, who wouldn’t want to drink their morning coffee in a seating area like that? 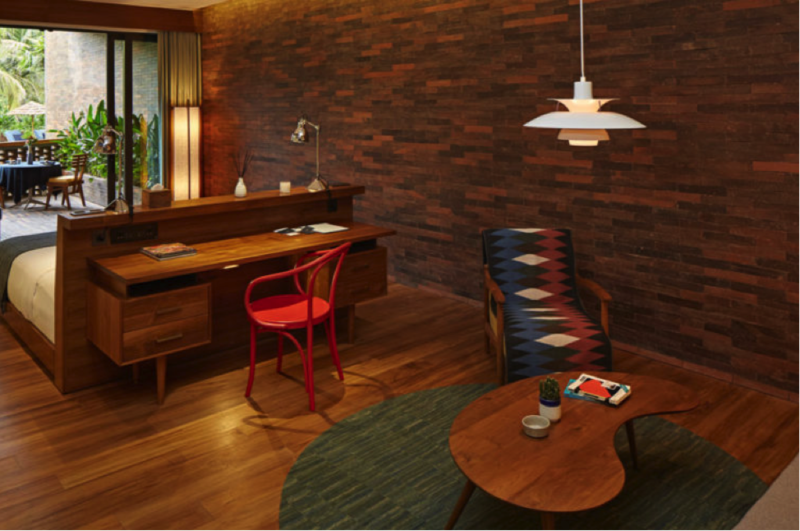 This one-of-a-kind Amsterdam hotel has just opened again after receiving a major facelift, and guests are raving about the mesmerizing interior design in each of the rooms. 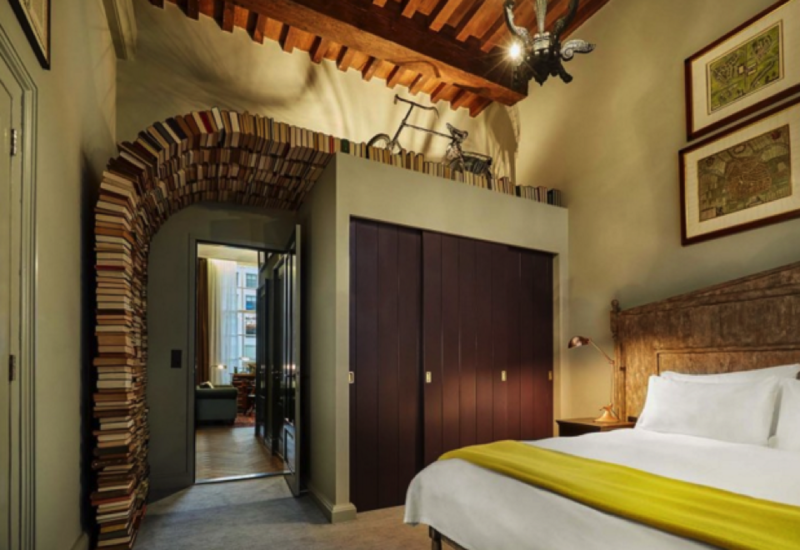 The brilliant aspect of the Hotel Pulitzer is that no two of their rooms are the same, and each one has something different to offer, whether it’s cozy and quirky or spacious and luxurious, the choice is entirely yours. The sliding wardrobe in this room is pretty fantastic, as is the magnificent stack of books. Perfect for any book worm! 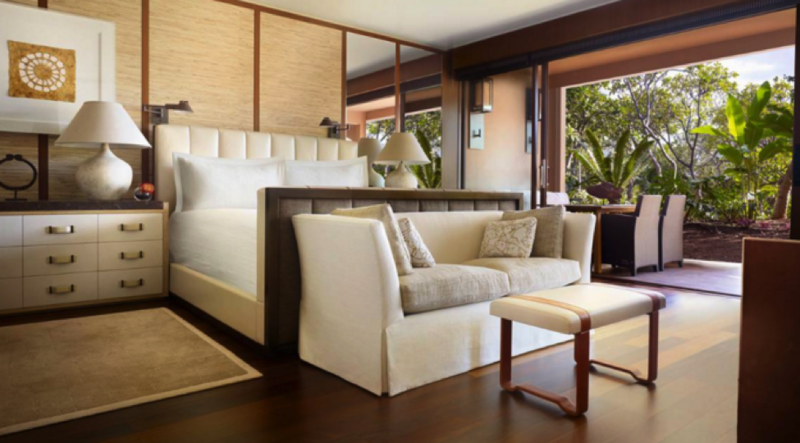 If you’re looking for that perfect summer beach getaway, then you’ll definitely enjoy a stay at the newly renovated Four Seasons Resort in Lanai, Hawaii. This jam-packed resort provides plenty of rooms and suites to suit any type of guest; the one in the picture is the luxurious Ohana Suite. The way in which the bedroom opens up onto the huge balcony is mesmerizing, as is the dark wood contrasting with the creams and whites in the room. With awesome interior design, unlimited rest and relaxation and one of the best beaches in the world, what more could you possibly ask for? This newly-opened riad/hotel is situated in Marrakech, and provides guests with a concept and experience that’s entirely unique. Decorated throughout in traditional Moroccan design, the interior designers fused this together with a gorgeous modern and contemporary vibe. Each room is full of curtains, throws, blankets, cushions, soft area rugs and dim lighting, creating a relaxing atmosphere that’s out of this world. Plus, each room provides many amenities including a fireplace, a walk-in wardrobe, under-floor heating, and two separate sinks and toilets. Situated on the vibrant and dynamic Maryah Island, the Four Seasons Hotel provides guests with a totally unique experience, and only the best interior design. Although each suite is a little different, it’s safe to say that guests leave them all feeling relaxed, rejuvenated, and a lot like royalty. Suites are decorated throughout in neutral shades, paired here and there with subtle accent pieces, as we can see in the Presidential Suite Sitting Room. In terms of interior design, the folks who designed the rooms in this brand new hotel really have selected only the very best furniture and accessories. 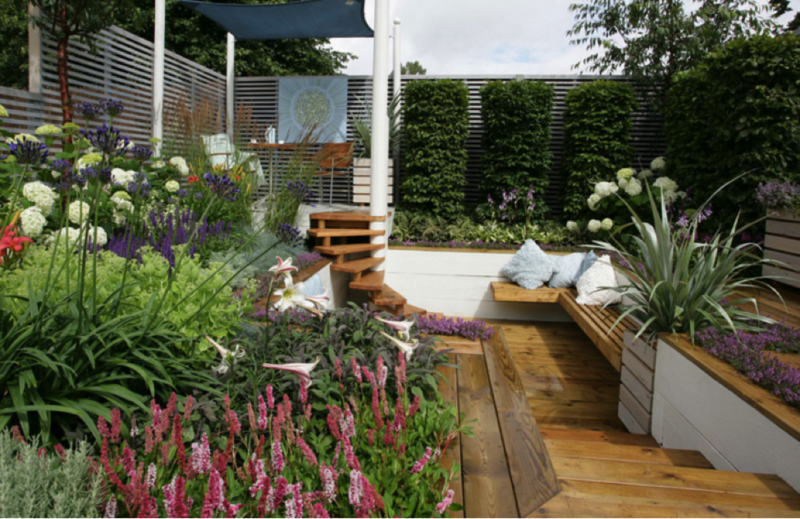 An awesome aspect of many well-known interior designers is that they don’t only focus on the inside of the home, and often draw their attention onto the garden. Having a home with a garden provides the perfect opportunity to get out and relax on a hot summer’s day, or spend the spring season planting pretty flowers. 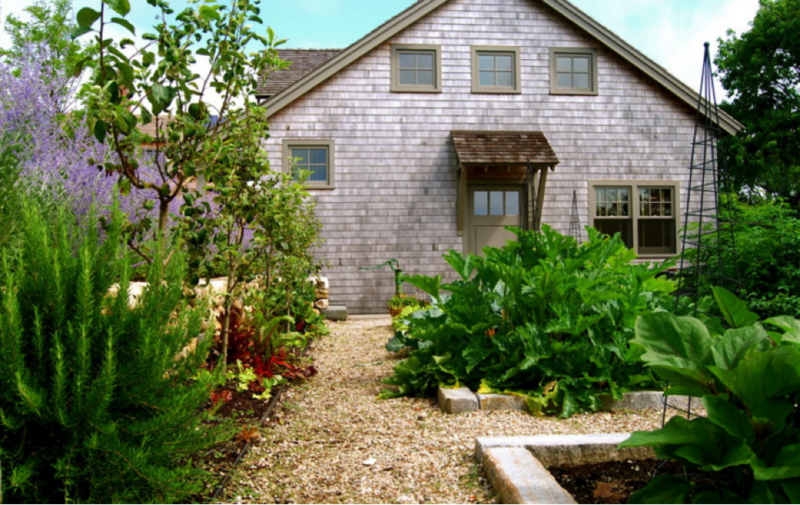 Some folks even choose to use their gardens to grow their own seeds and vegetables. What you use your garden for is your choice, but if you’re in serious need of some inspiration, here are 7 of the prettiest that you’ll ever see. It’s safe to say that this garden is absolutely stunning, and is sure to provide lots of pleasant evenings in the summer. 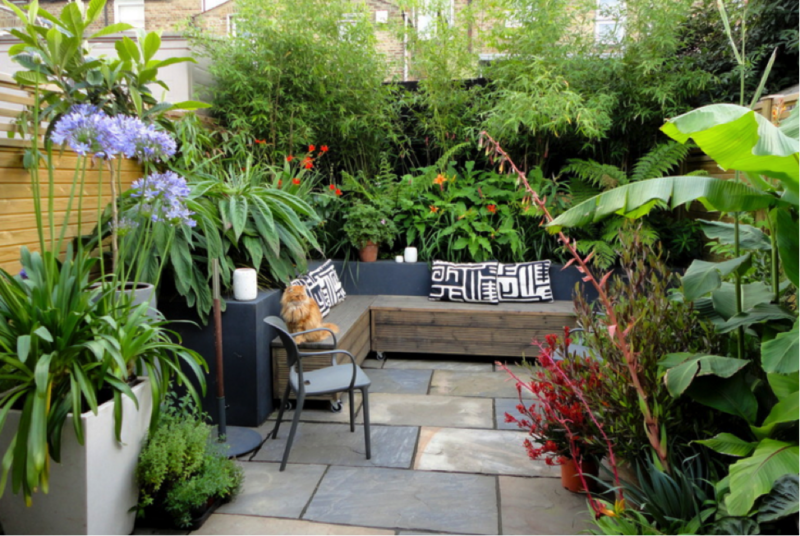 The modern and contemporary seating area is surrounded by an array of gorgeous exotic plants, and the concrete on the ground is definitely up to date with today’s design styles. So pretty! If you’re into the whole ‘straight out of a fairytale book’ thing, then you’ll definitely be a fan of this adorable English garden. 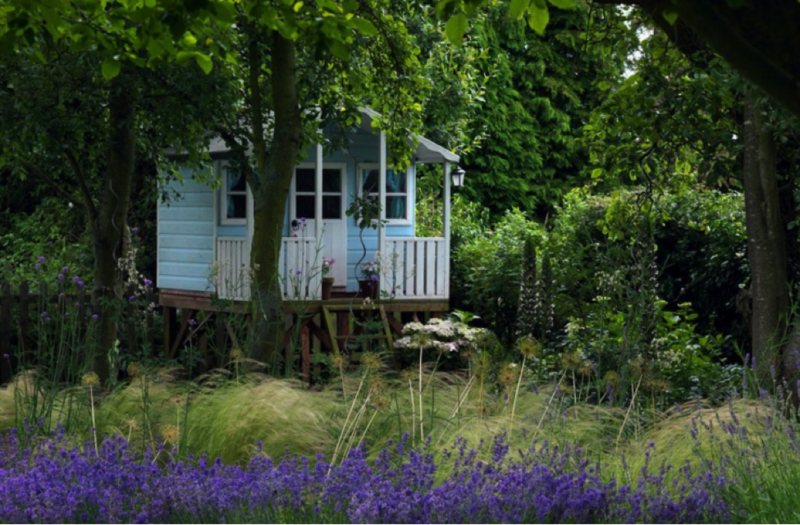 Wooden sheds/mini houses like the one in the picture are quite a common feature in UK gardens, and can be used for almost anything. Whether you choose to make it a cozy and comfortable room to hang out and read books in, or a place to grow your vegetables, is entirely up to you. This garden, with its stunning mixture of green, pinks, purples and whites, is perfect for anyone who loves ‘girlie’ colors. 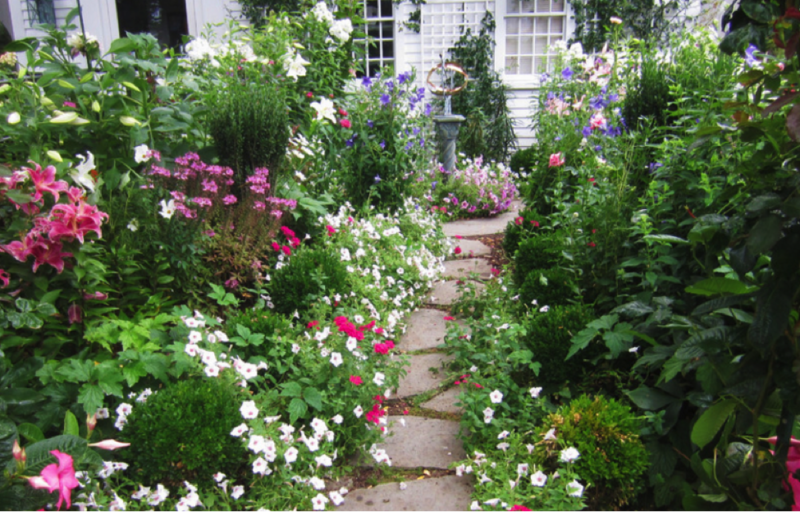 The cute stone walkway in the center of the plants makes this garden even more gorgeous, and the white paneled wood on the house goes with the theme perfectly. Japanese design is becoming increasingly common in homes, and in gardens, too. This Japanese ‘zen’ themed garden is a fantastic garden idea for those who want to do things a little differently. 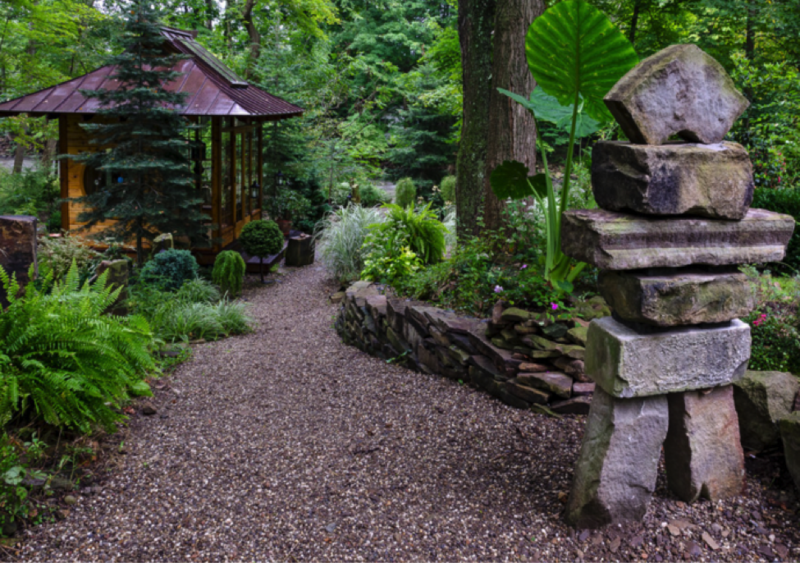 The rustic-looking low stone walls surround a wide array of exotic plants, and there’s even a little tea house, too! Whether you have a big family, or just enjoy having lots of friends round for dinner and drinks, a large seating area is always a great option. 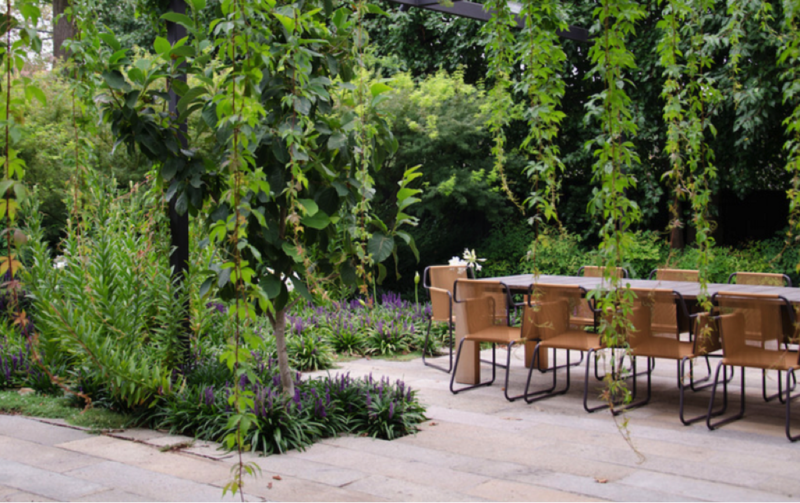 This sleek and edgy garden is full of hanging plants, and the table and chairs is used as the centerpiece. This classic farmhouse has a surprisingly modern and contemporary garden. Rather than wooden decking, natural grass or slates, the homeowner has chosen to use stones as the flooring, and it looks fantastic. The plants/vegetables are divided individually, which really makes this garden appear clean and organized. It’s definitely safe to say that this garden is a contemporary masterpiece. The wooden paneled floor is surrounded by stunning flowerbeds and a rich mixture of pinks, purples and whites. There’s even a cozy seating area, and an adorable stairway which leads up to a dining table. 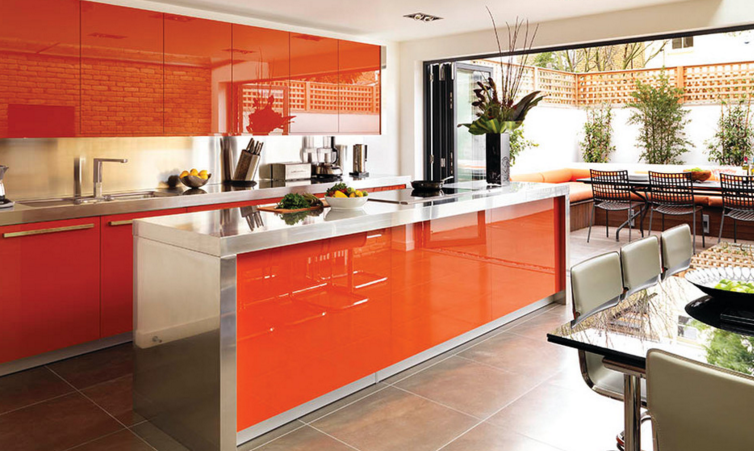 A popular room of choice for many interior designers is, of course, the kitchen. It’s the spot in which we cook, eat, drink and be merry, and just hang out – so why not make it look awesome? Although there is definitely a modern and contemporary trend going on with kitchens right now, there are a wide range of styles and designs that people are coming up with. So, if you’re after some serious kitchen interior design inspiration, here are 10 kitchens that will make you WOW. This kitchen, situated in London, perfectly combines the modern and contemporary look with a bright, quirky and edgy feel. The stainless steel countertops are topped with various fruit bowls and indoor plants, bringing together nature and modern design. Plus, the way the kitchen opens up onto the adorable outdoor seating area is amazing. This is the perfect style of kitchen for those who prefer the classic and elegant look when it comes to interior design. 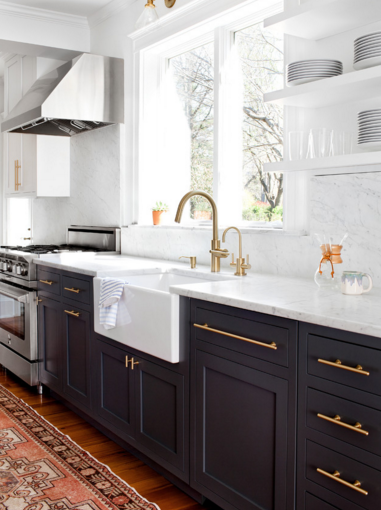 The white marble countertops contrast perfectly with the matte black cupboards and gold rails. This bright and airy kitchen is decorated with a rustic area rug, which only enhances this unique theme. 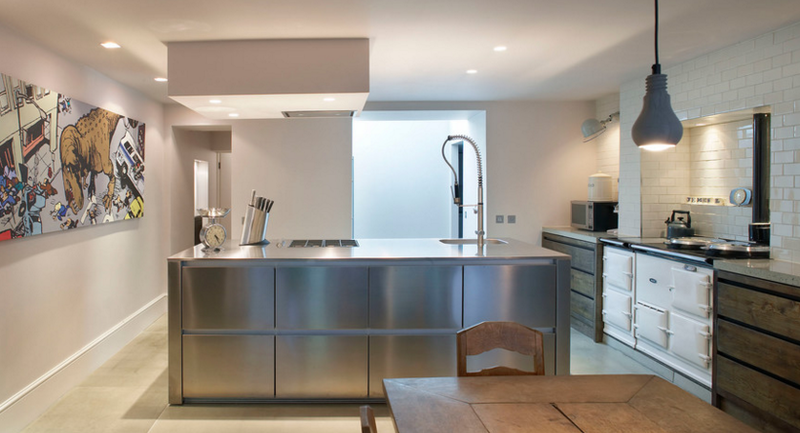 This narrow and spacious kitchen is, quite simply, a work of art. 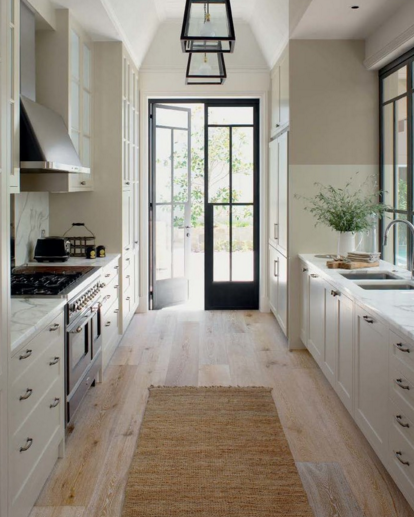 The high windows and doors let lots of light into this classic and elegant kitchen. The white countertops and accessories go perfectly with the all-wood flooring, topped with a rustic-looking and minimalistic rug. This one’s ideal for those who love having lots of storage options. 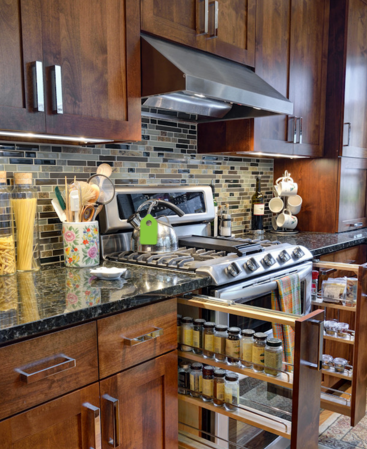 Let’s face it – who wouldn’t want a kitchen with its own cupboards that are solely dedicated to spices? This modern and sultry kitchen perfectly combines dark wood cupboards with dark grey marble countertops, and brings a comforting feeling of coziness and homeliness. For those of you who tend to hang out primarily in the kitchen, whether you actually intend to or not, it’s safe to say that you’ll be a fan of this one. This lavish and comfortable seating area is situated right by the window, and provides the perfect dining/studying area. The white countertops and cupboards match amazingly with the blue tiled walls and pretty area rug, combined with pretty plants and flowers dotted around. It’s definitely fair to say that the proud owner of this awesome kitchen has really made it their own. The floor-to-ceiling windows/doors provide a beautiful view of the green back garden, and there’s a Scandinavian chic look going on here which looks fantastic. The brick wall is one of the accent (statement) pieces in this kitchen, as is the subtle vase of orange roses. Quite clearly, it’s not all about the modern and minimalistic look these days. 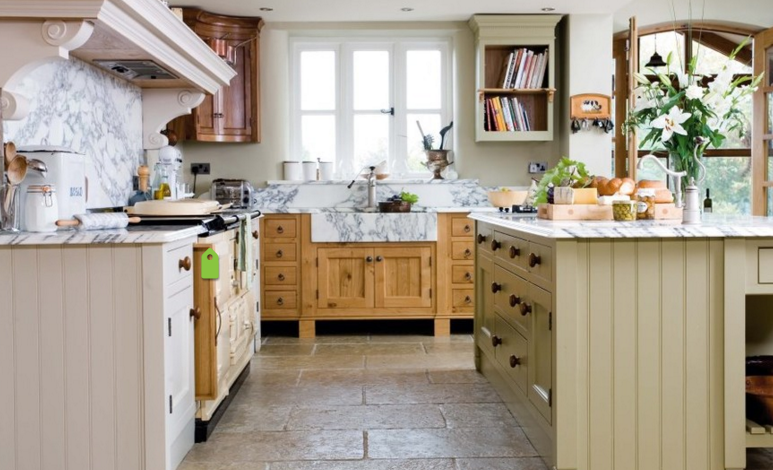 In fact, there are many folks who still prefer the rustic, classic and homely look, just like this French country kitchen. The worn-looking tiled floor and classic storage options only add to this awesome vintage look. Pendant lighting is becoming increasingly popular in kitchens due to its practicability. 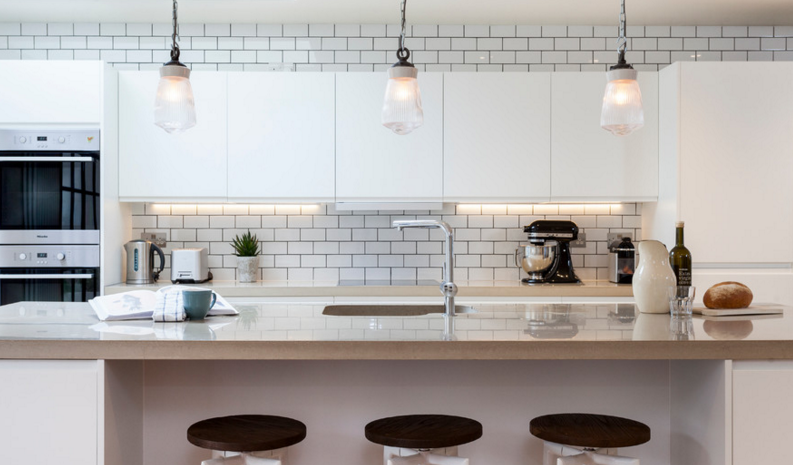 Pendant lighting draws light to one section at a time, which is perfect for rooms like the kitchen in which we tend to focus on one task at a time, whether it’s cooking, or simply washing the dishes. The shiny countertop and white tiles look awesome here, as does the ornaments and pieces of equipment dotted around. What too many people simply do not realize is that accents don’t have to stop in the living room and bedroom. Why not bring the concept of accent pieces into your kitchen? 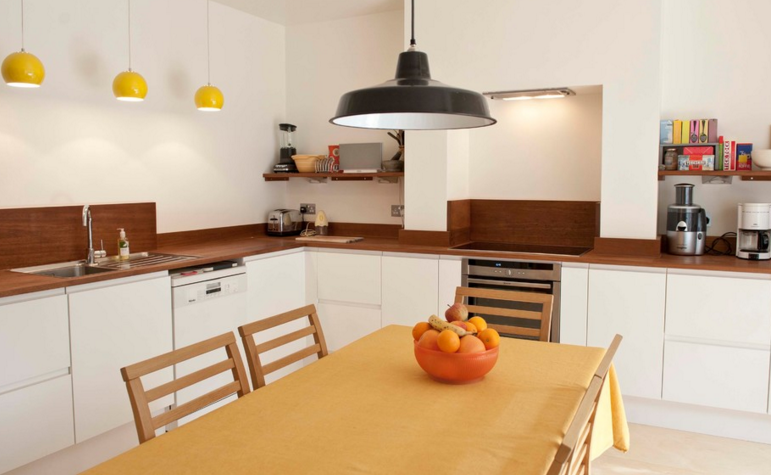 This modern kitchen, decorated in neutral shades, is brought to life by the bright yellow pendant lighting, the colorful cookery books, and the orange fruit bowl as the centerpiece. The way in which the interior designer has combined modern and minimalistic design with worn-looking, rustic and vintage furniture is really quite mesmerizing. The all-stainless steel countertop surprisingly matches the classic cooker/hob and wooden dining table, and the ceiling lights and pendant lights are the best options for drawing light onto one section at a time. All photos are by Houzz. In recent years, interior designers have expanded their attention and now not only focus on the home, but on offices spaces and business premises, too. More and more people have begun to realize that a well-decorated working environment is, in fact, a healthy working environment. 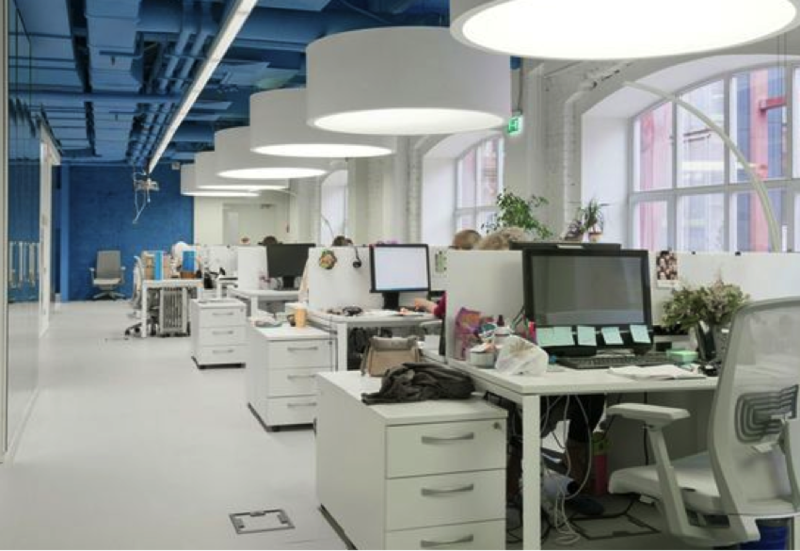 So, whether you’re looking for a little office inspiration yourself, or if you’re just curious to see how the style of offices differ in various parts of the world, here are the 8 must-see global offices. Nowadays, more and more people are beginning to realize the benefits of having their own office in their home. 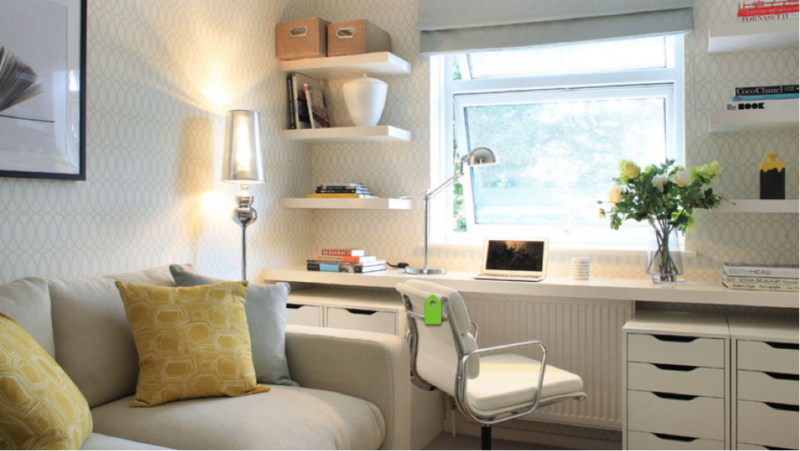 This modern and contemporary home office is situated in Ottawa, and is an awesome idea for small homes and compact apartments. 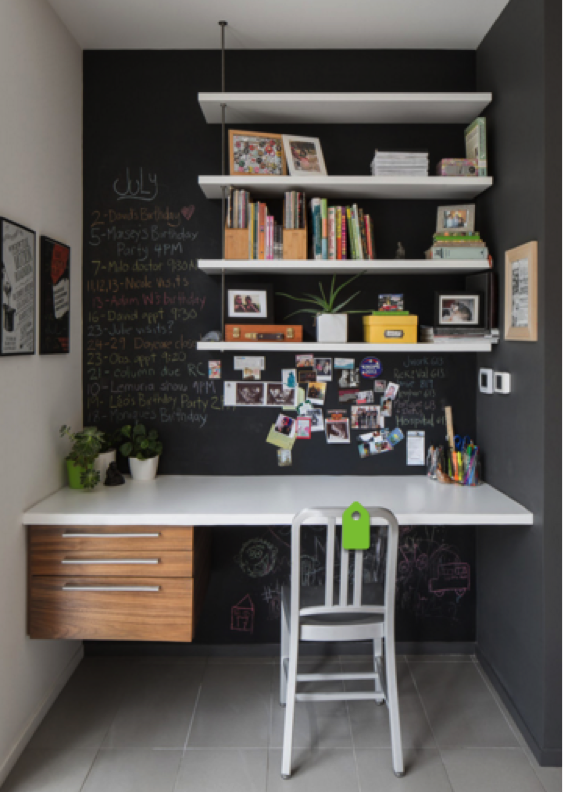 The minimalistic desk and chair look fantastic together, and the owner has clearly made it their own by turning the far wall into a super-cool chalkboard, dotted with a few personal photographs here and there. The cute indoor plants look great, too. 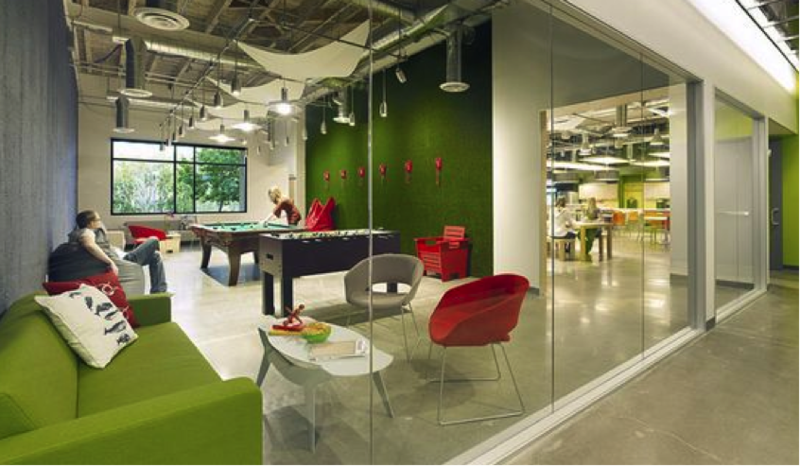 Many major offices these days are decorated in sleek, minimalistic furniture and neutral shades, but the folks who designed the Skype headquarters obviously had something a little different in mind. The green and red shades work amazingly well together, and the glass partitions as walls create a modern twist. Plus, who wouldn’t want a pool table in their work office? A dream come true for many. 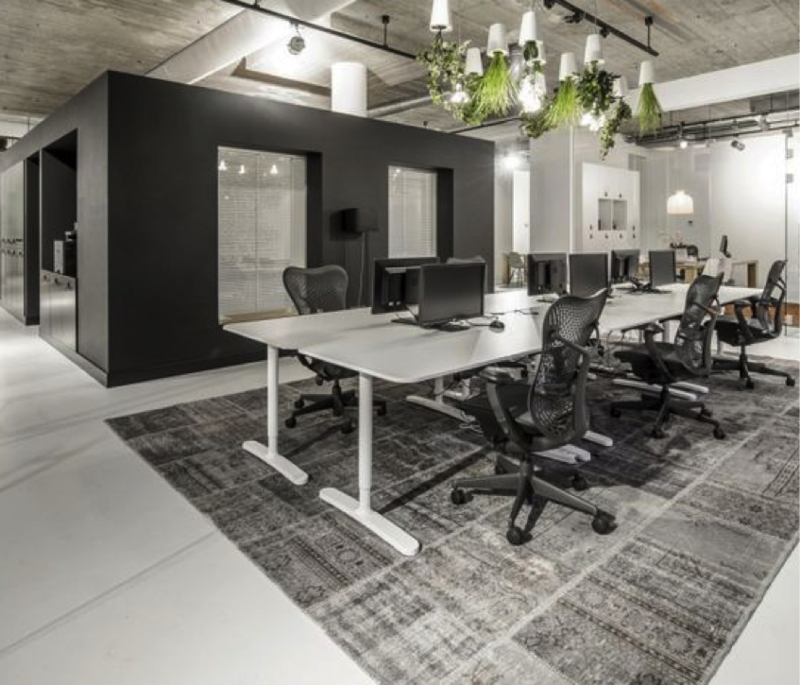 Those folks who love nothing more than modern, minimalistic and stylish interior design in neutral block shades will adore this office for Decom, based in Venray, The Netherlands. The long white table provides a close-knit working environment, but not one that’s too close for comfort or stuffy. The huge area rug looks fantastic over the all-white floor, and the green ceiling hangings provide the perfect accent piece. This superbly pretty study room is located in London, and the contrast between the all-white pieces and pastel shades works beautifully. This type of home office is ideal for those who love nothing more than to be comfortable – the chair looks super comfy, and the sofa provides the perfect spot to relax and take a break. The shelves are filled with books and items that reflect the owner’s personality, but aren’t full to the brim, making the office even more minimalistic. A vase of flowers always looks fantastic in an office space, too. 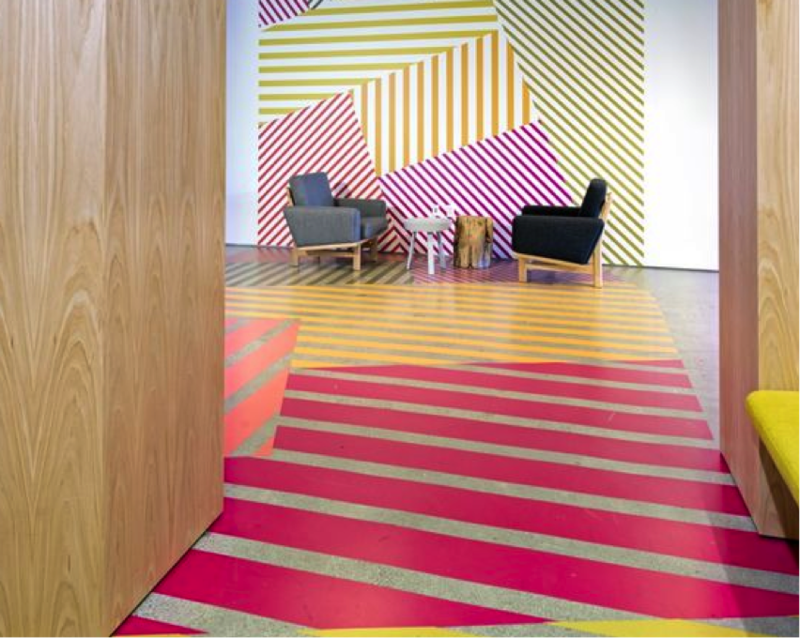 This bright and bold office space is different to many others due to its extensive use of eye-catching colors. Most office spaces these days are extremely minimalistic, so it’s certainly refreshing to see that many folks still love a good splash of color. The wooden paneled walls go with the patterned floor perfectly, and the seating area is perfectly modern and contemporary. Whether it’s in your office, kitchen, bathroom or bedroom, you should never be afraid of a pop of color. This Houston office space only highlights the fact that blue is an awesome color option for offices. A calming and tranquil shade, blue is ideal for working environments that tend to get a little stressful at times. Plus, good lighting is essential in offices, and these huge lighting pieces provide lots of light for each and every desk. This quirky and edgy office in Kiama, Australia, is bound to be an awesome environment for those lucky enough to work there. The minimalistic desks and shelves go together perfectly with the indoor plants, as does the top-of-the-range computers. 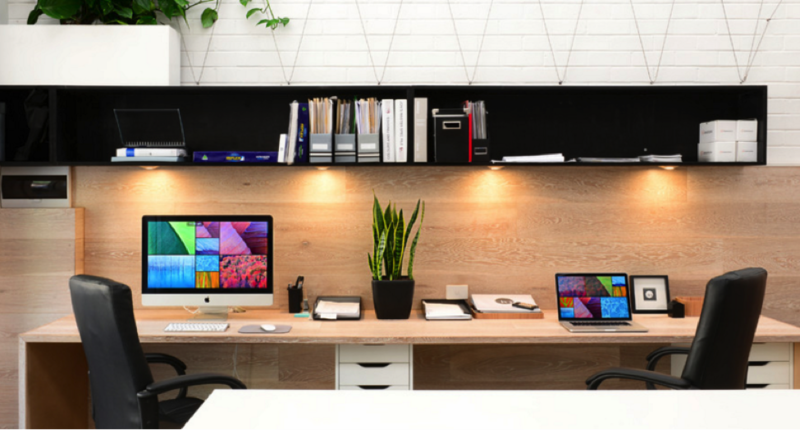 Tidy and organized, this office is guaranteed to be loved by those who hate clutter and mess. Muuto is a well-known Scandinavian interior design company, so it’s no doubt that its office space in Copenhagen, Denmark, will reflect just that. 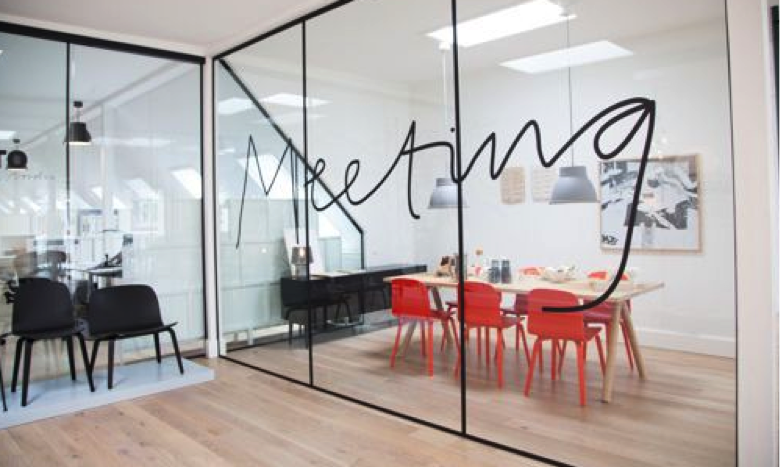 The huge ‘Meeting’ piece scrawled across the glass partition looks amazing, as does the quirky pendant lights hanging from the ceiling, drawing just the right amount of light onto the meeting table. The black and red furniture combined with the Scandinavian chic, minimalistic wooden floor, looks out of this world. Pale timbers are subtle and easy to live with, but when it comes to adding luxury and sophistication to a space, nothing beats rich walnut. Darker timbers are enjoying a renaissance right now across Europe, the US and Canada, with designers offering up a plethora of gorgeous furniture designs that are all about showcasing the inherent beauty of the timber’s natural swirls, knots and grains. It’s a distinctive nod to 70s styling, but with a contemporary twist – think a moody, retro colour palette with modern, pared-back lines that bring the look right up-to-date. 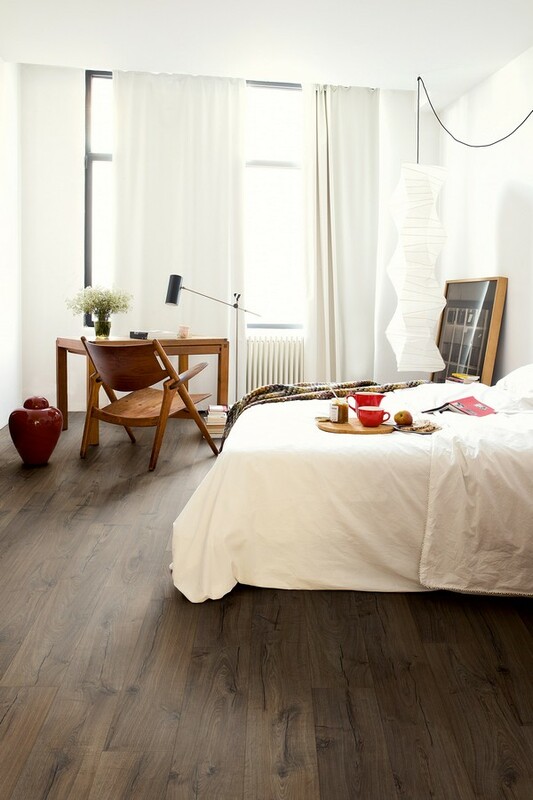 Take your pick from dining tables, chairs, coffee tables, bookcases, consoles and bedside tables in shades of black and deep chocolate brown, which can be used on their own alongside pale furnishings to create an instant focal point within a room, or combined with timber floors and lighter timber pieces in tonal shades to create a rich, multi-layered feel. Walnut and other dark finishes also work beautifully paired with this season’s hottest soft furnishing shades – pale blush pink, inky blue, teal and charcoal. For an on-trend look, consider placing a walnut coffee table on a fashionable overdyed rug in navy or a pretty pastel; popping a patterned teal cushion or silvery grey throw on a walnut-framed armchair; or jazzing up a rich timber side table with a collection of eye-catching glassware in myriad shades of blue. To add even more drama to the dark timber look, introduce a few pops of metallics, such as a hanging pendant or dramatic standard lamp in antiqued bronze; a brass side table; or some gorgeous accessories in copper or rose gold. 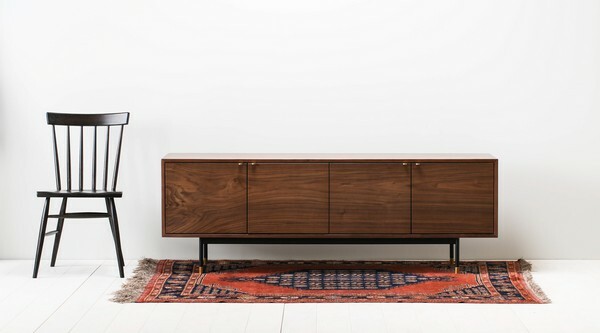 If it’s a look that gets your pulse racing, the first step is to choose the perfect walnut piece. 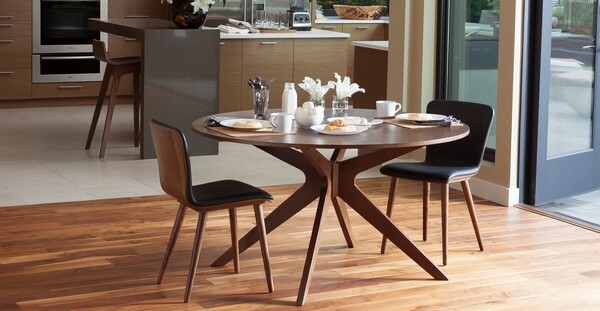 Start right here by checking out our sleek, stunning Conan round dining table; low-slung Myron Frederik Rectangular coffee table; and Tricia dining chairs in Walnut and Barley – all ideal for adding a little spice and sophistication to your interiors.